What Should I Know About... AI? As we work our way through terms that are increasingly appearing in sensationalist headlines, our attention in this post turns to artificial intelligence. Or rather “AI”. In its simplest form it’s the concept of machines doing things that, if a human did them, you would say that it required intelligence. This was the definition coined by university professor John McCarthy in 1956 as part of a summer side project he and his friends were looking into. There is a tendency to anthropomorphise the actions of machines which would imply that computers are “thinking” and “consciously” doing things. In reality, computers are crunching through tons of data and taking action as a result. This is a “mindless” activity, but nevertheless resembles the process of human thinking, and therefore intelligence. The data being processed takes many forms, such as pixels (for image recognition), sound waves (for audio detection) and even financial (for fraud detection). The volume is typically at a level that far surpasses human comprehension, and as such it holds the potential to bring insights beyond what we can (literally) imagine. 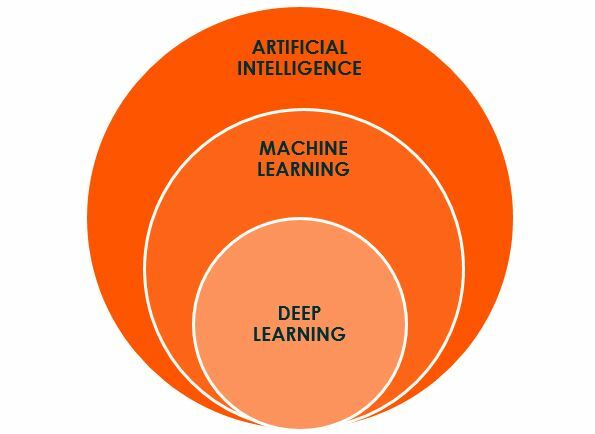 There are different layers of artificial intelligence, often depicted as a concentric circle, such as below. For this article we focus on the outermost circle, turning to the move advanced aspects of AI in a future post. For now, let’s delve more into AI. Within the broad definition of machines doing things that we’d think humans need to do there is room to sub-categorise. The simplest distinction is between “narrow” AI and “general” AI. This is where a computer is set a predefined task and has to work out the answer. It is the level of AI that we are currently at, and is demonstrated by things such as teaching a computer to play chess. The computer has been given a set of rules (i.e. each piece can make this move, the game is won at checkmate) and then it processes this data to make its move. In this field we have seen computers beat humans in a game, which would imply that AI is superior to human intelligence. However take that same robot and try and play a game of Scrabble, and even the most novice human player would win. The computer would need to be programmed to know the rules of the new game. This is what the computer science community is currently striving for. It is where a computer can, without being told the rules of the game, be applied to any environment and begin being useful. It is also referred to as “human level” AI as it involves levels of abstract pattern recognition incredibly difficult to predefine. The concept is that humans are able to be put in fairly complex situations and be able to filter out the noise and make connections in such a way that they can make decisions and draw insights without particular direction. When the current news headlines talk about “breakthroughs” in AI, it about this level of artificial intelligence, whereby a computer has been designed that can understand a situation and make decisions that involve complex, difficult to define concepts. This is when machines become able to surpass the level that humans are at in almost every field of thinking. There’s a ton of speculation and uncertainty around if, or rather when, this will be achieved and we’ll leave this for a future post. More than most, artificial intelligence is an area that splits the scientific community. The optimists say how this will revolutionise and augment the human experience. There are problems that exist today that are beyond the comprehension of humans. Whilst the best minds are looking into how to cure, say, cancer, the sheer mass of information that exists is almost overwhelming to be done through human thought alone. Applying AI to sift through billions of data points (whether that be patient records etc.) can bring insight that would take humans centuries. Already advancements are being made in the medical field. The clearest example is in the detection of tumours. For years doctors would get a scan of a patient and use their eye to determine whether the patient had cancer or not. This had a ~80% success rate. Through training machines to look through vast swathes of data on patient scans, and be told which scans did indeed have cancer, which didn’t a computer can do the job of detecting present day scans with a success rate of ~90%. Even the most ardent AI sceptics wouldn’t have an issue with a machine assisting with discrete tasks such as improving the accuracy of diagnoses. What they do have an issue with however is that once you develop AI to a certain level, it is like you are “summoning the devil”. Well, by creating machines that have the capacity to “think” abstractly in ways that humans are not capable of comprehending as well as take actions then there is the danger that the machines’ goals are not aligned with those of the human race. Stephen Hawkings says AI could be “the worst event in the history of our civilisation” because with machines being capable of doing things which are beyond the control of humans, they will naturally make decisions that favour their own longevity, which could be at the expense of humans. One thing for sure is that the future is uncertain, and that in the here and now, advancements are being made in artificial intelligence which we will discuss. The most famous that you’ve heard of is probably Siri – the voice-recognition software of the iPhone (more recently Alexa from Amazon). What’s happening here is that humans are speaking to a robot and getting an answer, much in the way you might ask your friend what the weather is going to be like today. From a computer perspective, what’s happening is that a machine is detecting the audio waves produced when speak, interpreting these as language, detecting the question that underlies, searching through a database of information and returning the specific piece in a comprehensible manner. When we talk about the distinction of narrow and general AI, it is often pointed to information recall (narrow: when was Henry VIII born?) and judgement (general: was Henry VIII a good king?). To answer the second requires much more abstract connection and conceptualisation. Under the premise that there’s lots of data in the world and (well trained) machines are able to draw more insight from it than humans, there are specific areas where AI has the ability to improve your business. At its basic level, an AI related service works by “plugging in” the data you’re collecting and interprets it in a way which is relevant for the problem it’s looking to solve. There are countless actions that take part in a buying process which are beyond the capabilities of one person to grapple with. Things such as how long a prospect reads your material for, the words they use on the phone when calling, and the websites that they visited before arriving at yours. Advancements in technology mean that this data is being collected, but even the best salesperson is unlikely to be able to analyse and draw insights from all of their interactions. This blog post goes through ways that things such as sales targets can be improved and prompts for future phone calls can be given, through use of AI on sales-related data. This is a common use case, and is (for now at least) often synonymous with “chatbots”. Essentially it involves setting up answers to common questions so that rather than having to employ a human to answer them routinely, you can have a robot do it automatically. It’s a bit like those call centre menus “Press 1 for opening hours, Press 2 for returns” but rather than pressing buttons, having the customer use natural language so that it feels more conversational. When do you close on Saturday? Can I still come in over the weekend? And the robot would “understand” that each person was asking the opening hours, and direct them accordingly. A human would find this quite natural to understand, but the science required to recognise the patterns in the words is the difficult challenge from a tech perspective. Again this is an area where there is tons of data which humans are barely scratching the surface of insights possible. With any accounting or financial system there will be lots of data where it will be difficult to, say, detect fraudulent transactions with a human eye. For the machine to have a step-change in understanding, the volume of data needs to far surpass the capabilities of a human worker and so has the most impact at scale. This article explains more on its role with accountancy. In this post we’ve covered the broad overview of the developments in artificial intelligence, the benefits and dangers it can bring, and applications for the modern business. When we’ve spoken previously about automation taking jobs, it’s essentially will AI complete this routine function better than a human. There’s much more to the relationship between human and machine, and the societal implications that can come from it. We’ll cover this more in our next post.